German students are stretching the scope of European rules in national higher education systems. 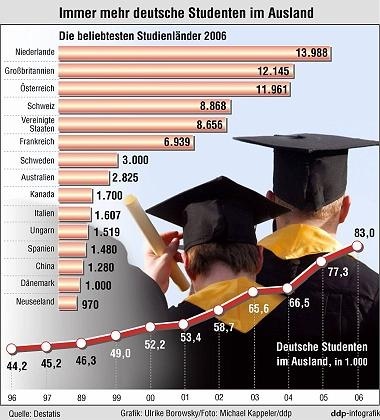 The last few years have shown a steady increase of German students in its neighboring countries. 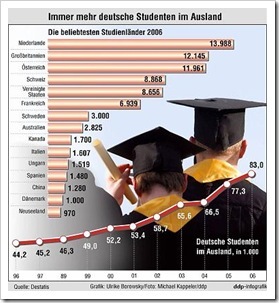 The number of German students in German speaking countries like Austria and Switzerland have increased. However, the most important destination for foreign students is the Netherlands with almost 14,000 students in 2006 and at least 16,750 in 2007 (pdf), making it also the largest group of international students in the Netherlands. I recently wrote about a German student, Jacqueline Förster, who claimed Dutch financial support for the period she studied at the University of Maastricht. Now there is a German student appealing for the European Court of Justice in order to be admitted to the Medicine programme at an Austrian University. The case of German students in Austrian medicine departments has been addressed here a couple of times. See the posts on Europeanisation by stealth and the one on more Europeanisation. Since the last post on this issue, two important developments took place. First of all, Austria got permission to keep their quotas for German students in medicine programmes for a five year period (until 2011). And secondly, the Austrians have abolished the student fees in 2007 – after introducing them in 2000. The quotas are now being contested by the German student. And considering the free education in Austria, universities are fearing an unmanageable rush of German students (‘ein kaum bewältigbaren Ansturm’, as the Vice rector of the University of Salzburg put it). Of course, the students can’t be blamed for this. They are just exercising the rights given to them. And don’t understand me wrong. I think it’s a good thing that students can make their own choice in the university where they want to study, whether that is in their own country or in another European country. In a European system where higher education is still predominantly publicly funded, and funding is arranged on a national scale, coming from national taxes, this type of mobility however might become unsustainable. That is, if it’s distributed highly unequally. This doesn’t mean that we have to stop the mobility, but it does imply that we seriously have to look at other funding arrangements. In some countries, like the Netherlands, student financial support is already ‘portable’ for students, meaning that students are eligible for Dutch student support, also if they study abroad. This idea could be extended to student funding. The portability of student funding within Europe should be a serious option here. In this case that would mean that Germany would fund the German students’ education in the Austrian university. This however would require a common policy, agreed upon by all member states, or at least a large majority of states. Politically it will be hard to reach agreement on an issue like this. But it’s better than the option of doing nothing and letting the ECJ determine the course of higher education in Europe. Of course it is the ECJ’s job to interpret and observe the rules. But it is about time that the Member States agree on the extent of these rules and put the decision-making process back where it belongs: in the democratic European or national parliaments. 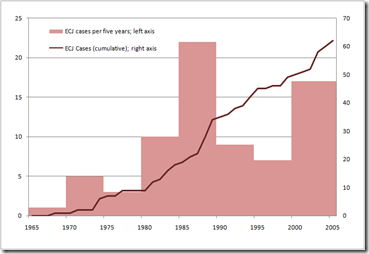 The last decades has seen a growth in the higher education related cases brought to the ECJ, especially in the 1980s and in the first part of this decade (see below). This is particularly interesting because formally, the EU has no real authority over higher education. Nevertheless, in these cases, the Court has considerably extended the competencies of the European Union in the field of higher education. And for those that think that this expanding role of the ECJ is just an isolated case for higher education: it clearly is not. That is why it would have been wiser to frame the Bologna process in a Directive in order to submit the building of European Higher Education Area reform to a democratic process and give clear rights to every students and not let alone the ECJ build an European Law of Higher Education. Merely wanna say that this is very useful, Thanks for taking your time to write this. ???????????????????????????????????????????????????????????????????????????????????????????????????????????????????????? SUI??????????????? ????????????????????????????????????????? ??????????????????????????????? ????????????CO2?????????????????? ???????VIP???? ?Y(NPY) ?????????? ?????????????????????????????????? Gary Pepper Girl???? Marie Claire (HK) Edition	???? ?Nicole Warne??????? ?Gary Pepper??blog???????????????????????????????????????????????? Any wounded player, especially star players, could be a team’s downfall. and extinguished in the blink of the referee’s eye. john masters organics ?skincare????????????????? john masters organics,skincare,??????????? You managed to hit the nail upon the top and also defined out the entire thing without having side effect , people could take a signal. Thank you for all of your labor on this web site. Kate takes pleasure in carrying out investigation and it’s easy to see why. My partner and i notice all about the dynamic manner you produce useful things on the website and in addition foster participation from other individuals on that issue plus our own child is certainly studying a whole lot. Enjoy the remaining portion of the new year. You’re the one carrying out a powerful job. I want to get across my gratitude for your kindness supporting people who really want help on your concept. Your very own commitment to passing the message all around came to be extraordinarily invaluable and have surely encouraged some individuals like me to realize their ambitions. This interesting facts can mean this much a person like me and much more to my office workers. Regards; from all of us. ??????????????? ?Sailor Moon????????? Marie Claire (HK) Edition	?????????????????????????M8????????????????????????????????????????????????????????????????????????? A Don’t be one of these simple players who builds a stack only to lose it with one dumb call. Along with the RNG is really a pair of specific algorithms that produce deterministic decisions based around the players in the game. opponents you could encounter on a regular basis. playing roulette, with baccarat and craps being about 2. ” That knowledge isn’t necessarily derived from your individual experience but may be acquired from the connection with others. to be good at poker, you must know several things about how to acquire there. ” That knowledge just isn’t necessarily based on your own personal experience but can be acquired through the example of others. your seasonal name. If you wish to be good at poker, you must know a couple of things about how exactly to acquire there. type in the equation an odds calculator is necessary. I simply had to say thanks yet again. I’m not certain the things I could possibly have used in the absence of the actual solutions shared by you about that topic. It became a real daunting matter in my circumstances, but looking at a professional mode you treated it forced me to weep over contentment. I am happier for the advice and even hope that you really know what a powerful job that you’re putting in training people thru your blog. I know that you’ve never met all of us. and reality. Simple pot odds calculations is often done in your brain, but as increasing numbers of complex variables enter the equation an odds calculator is necessary. roulette, with baccarat and craps being about 2. 5% playing roulette, with baccarat and craps being about 2.
can bluff and win big pots later if you will have the top hand. going to get lots of remarks about your seasonal name. I’m also writing to let you understand of the perfect encounter our girl developed viewing your web site. She came to understand too many details, with the inclusion of how it is like to have an incredible helping spirit to get the rest quite simply completely grasp a variety of impossible topics. You actually surpassed people’s expectations. Thanks for producing such invaluable, healthy, revealing and as well as fun guidance on that topic to Evelyn.